On Monday, a mysterious train chugged into central Beijing, which led to a series of speculations. All these speculations, however, came to an end later with the official statement that it was Kim Jong Un, the North Korean leader who made an “unofficial” visit at the invitation of the Chinese president, Xi Jinping. It was his first overseas trip since he got power in 2011. 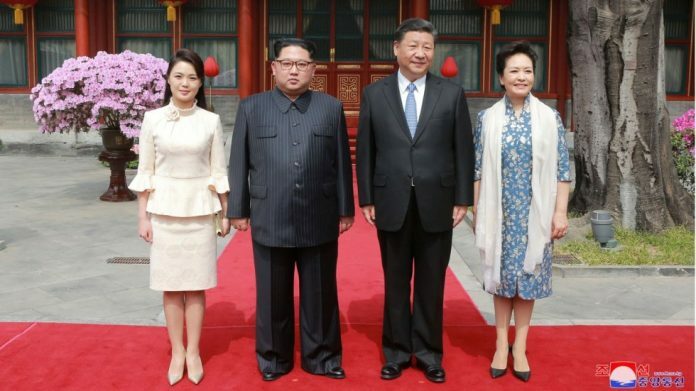 He was accompanied by his wife, Ri Sol Ju and top aides including Choe Ryong Hae who is known as the most powerful leader in North Korea after Kim Jong. There are summits planned for North Korea with its foes in both Washington and Seoul. This meeting with Xi Jinping is seen as the most tangible and dramatic step before these summits. China has always been a strong ally to North Korea providing all the vital aid, trade and diplomatic support required to keep the country’s broken economy afloat. However, in recent years, the relationship between the two has been stressed and this move by Kim Jong is seen as a measure to repair it. China also wants its relationship with North Korea to improve. It will surely help it in regaining its influence in the region, which is lying just in its backyard and protecting its interests.